A little while back I wrote about the appeal that the phrase “Use what you have and you will never be without” holds for me. I applied it again recently when I was feeling guilt about the fiber tools/patterns/techniques that I have rarely and sometimes never used. I usually get them for two reasons: 1) they are new and interesting and get that adrenaline flow going about how much fun they would be 2) I tell myself that with the new tool I will surely use up lots of my pounds and pounds of fiber sitting in the attic in plastic bins…. Okay, that worked well when I bought a lucet over two years ago. A cute, inexpensive, beautifully made wooden tool that has been around since the Middle Ages which you can use, among other things, to make braids. My supposedly rational thought: I can use it to braid lots of my roving and make seat pads which I have always wanted. I put it on a shelf where I could admire it… and never touched it again. So the other day I decided I would take a couple hours and have a learn new skills afternoon. I first went for the lucet and watched a youtube video. When I learned to spin back in those Middle Ages there was no youtube and few books on spinning. Much harder to learn things then. I do appreciate the internet for that. Here are my results. That was fun. 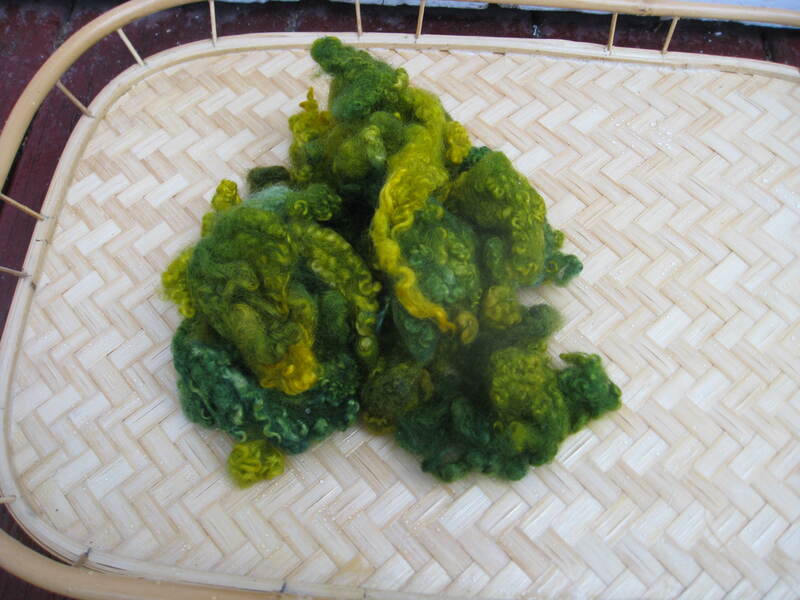 I can make lots of braids and sew them together for seat mats and virtuously use a lot of fiber. Then I looked under something on my table and found an article that I had gotten from somewhere and even put in a plastic sleeve (I love office supplies, I feel so organized and efficient, I enjoy wandering around Staples even if I don’t get anything) and then forgotten of course. There was instruction on how to crochet circular or square mats from roving- which meant no sewing braids together. That sounded good. Easier to complete and could use up pencil roving I bought and never used for spinning because I found the quality was not as good as I had hoped and it fell apart more easily than I expected when spinning. Much better for ktichen chair mat- but how will I use the lucet now? It is back on its shelf and still looks beautiful. Next skill to learn: chain plying. I had done some in the past and found my yarn was pretty twisty, and several months ago been shown another technique. I watched the video I made of my friend doing it -got to love that technology once again and believe me, I am not a big electronics fan but I guess as with anything else that helps my fiber, I like it for that! 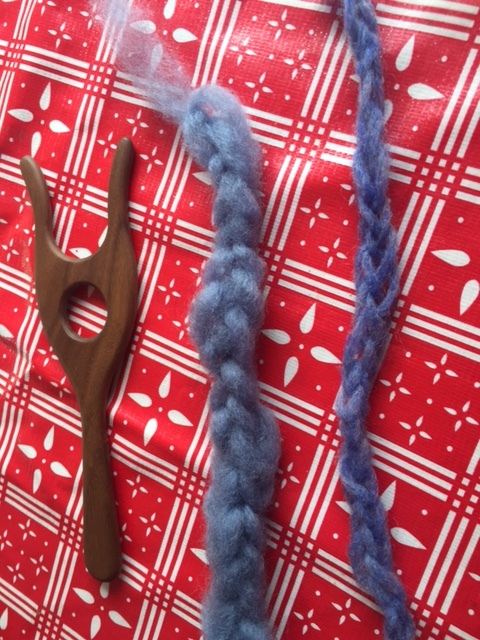 I practiced and created two skeins that were a bit twisty but became balanced when soaked in warm soapy water. 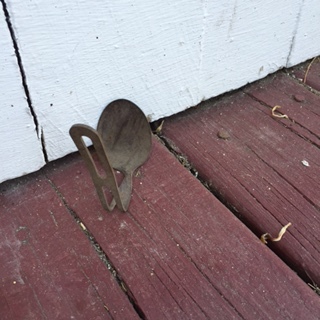 I hung the yellow one on that spoon like thing I dug up when putting in herbs behind the barn. 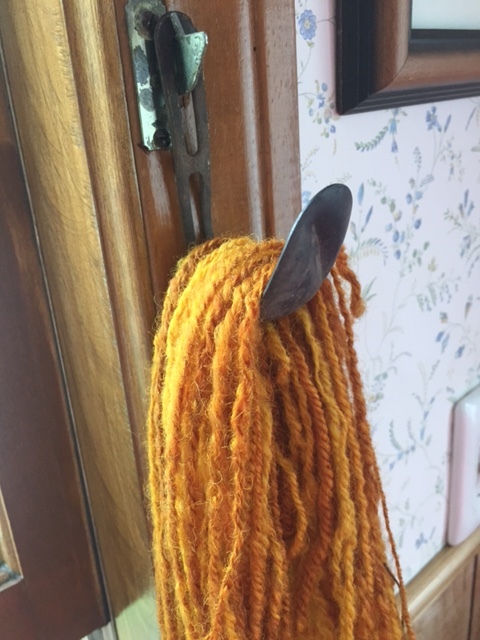 I still don’t know what was used for but now it is a proven yarn dryer thing. definitively tell me what it is. 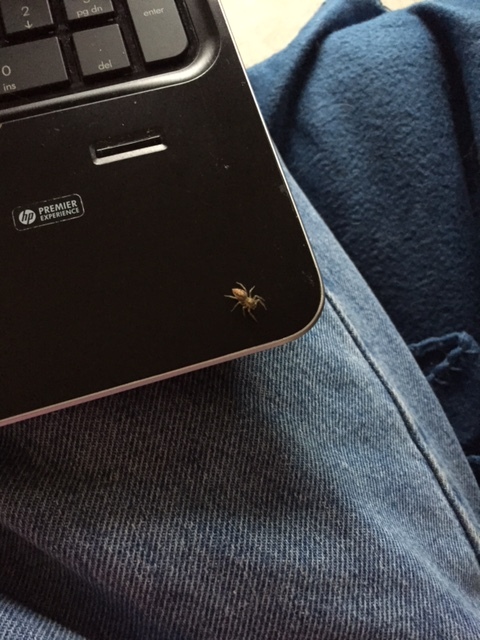 I have to interrupt this train of thought because a friend, sort of a spinning sister, just dropped in. Spinners and weavers have an affinity for spiders since they also spin and weave. Uh oh. 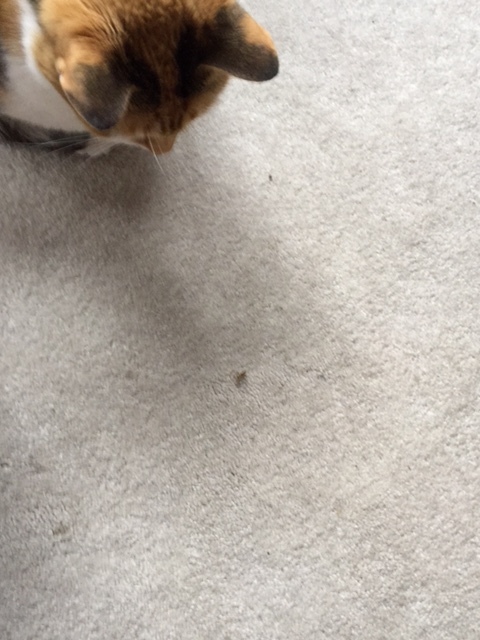 Someone else just found you too. 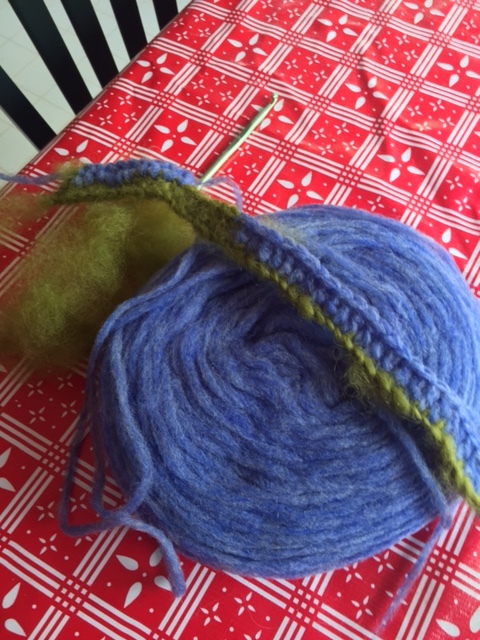 This entry was posted in Uncategorized and tagged cats, cats and spiders, chain plying, crocheting, dyed handspun yarn, handspun yarn, learning new skills, lucet, self sufficiency, spiders, spinning wool, uses for wool fiber, Waylon Jennings, wool braids, wool roving, wool tools Middle Ages on June 15, 2015 by Betsy Alspach. At Christmas when I received books I realized I already had several that I hadn’t read, or had only read partially. I put those books in a basket and decided I would not take a new book out of the library until I had read those. I do keep a list of books I hear about that I would like to read when I have earned it. He didn’t seem to care and certainly neither do I. We all need to do what feels right inside of us and it is different things for different people. I feel privileged that I am able to take time each week to indulge myself in trivial pursuits that give me peace in an uncertain world. I think that when we pursue peaceful goings on in whatever form they take there is some good being given out to counter the unpeaceful things in this world. Certainly his book, published in 1944, continues to radiate peace. Thanks E.B.! This month I want to talk about the also peaceful Bluefaced Leicester sheep. They have the sweetest little curls in their fleece which has great sheen (shine). A friend and I “disagree” about the outward appearance of these sheep. I dearly love them but I think their faces are, well, kind of unattractive. The babies look like little aliens to me. She doesn’t think they are ugly at all. 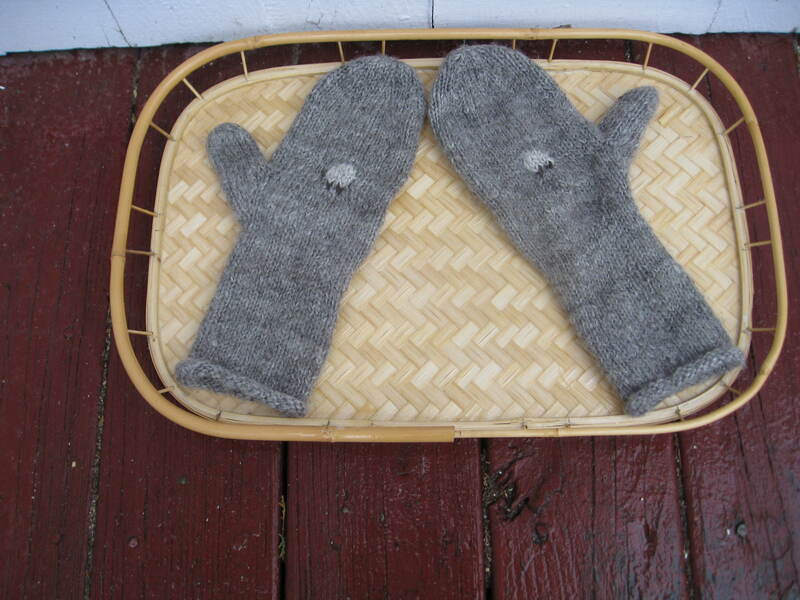 Here are mittens I spun several years ago and wear a great deal each winter. 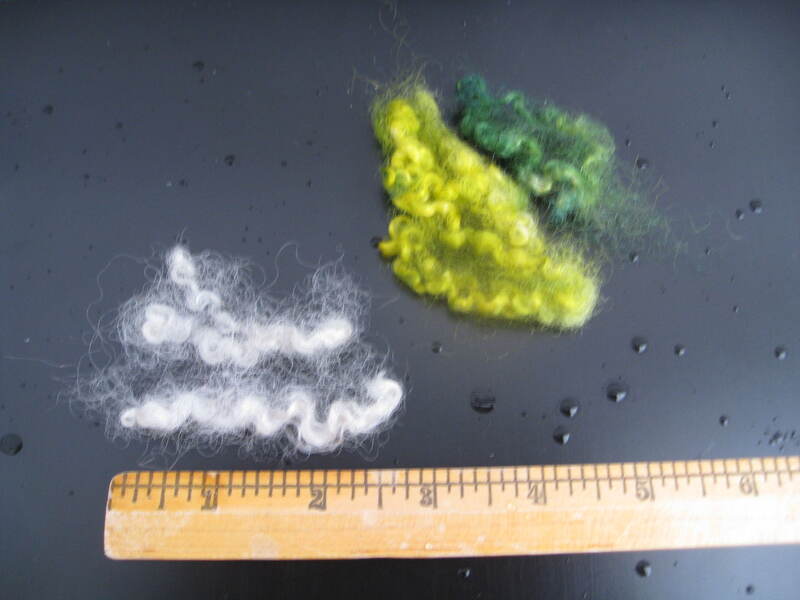 Still in excellent shape, This fiber was from a BFL lamb named Millie. More on the wonderful Bluefaced Leicester next time! Until then, find a trivial pursuit that gives you peace and go do it, even if you only have a few minutes. E.B. would approve. 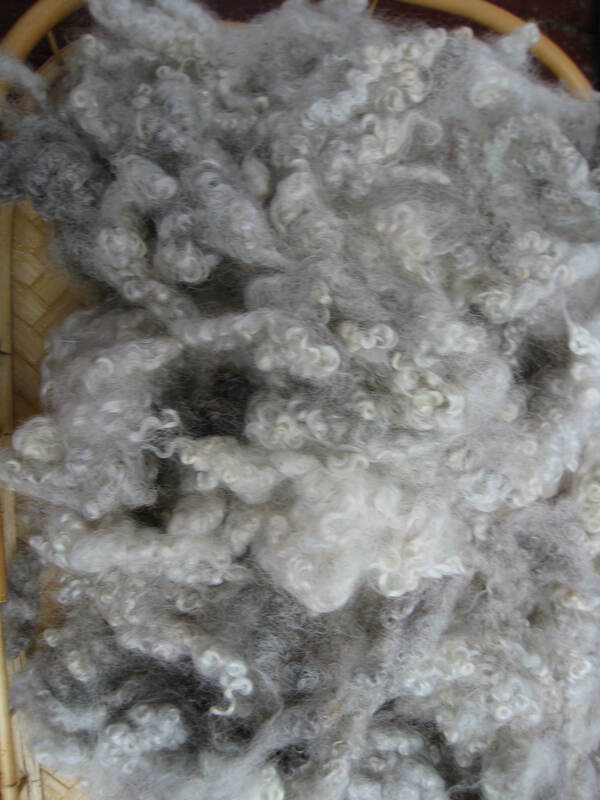 This entry was posted in Uncategorized and tagged Bluefaced Leicester Sheep, Bluefaced Leicester wool, E.B. 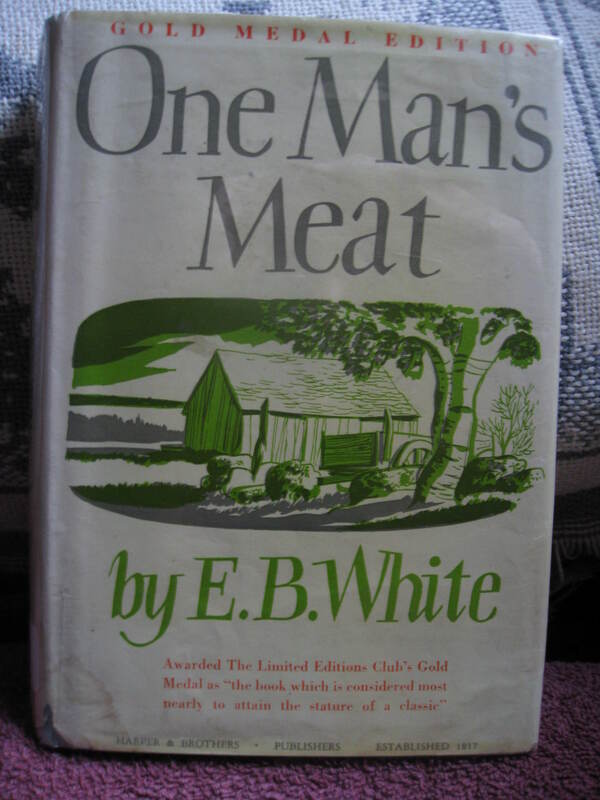 White, E.B. 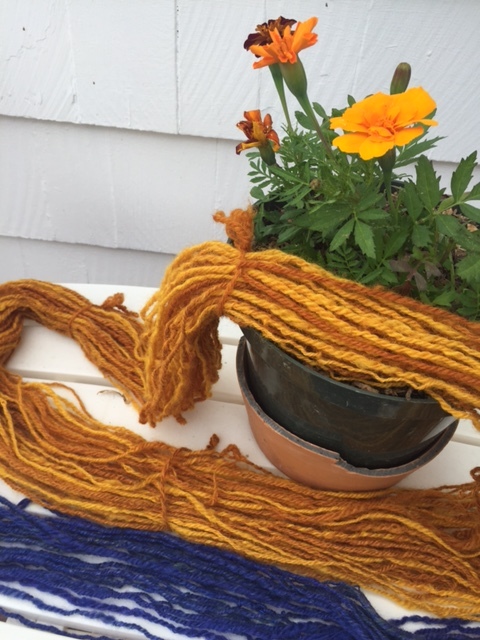 White books, fiber spinning, hand dyed wool, handspinning, handspun Bluefaced Leicester mittens, handspun mittens, handspun yarn, One Man's Meat, our own peace, peace, spinning wool, Tumble Creek Farm on April 9, 2015 by Betsy Alspach.